Juicy Pan Seared Salmon topped with a fresh tasting sweet and lightly spiced pineapple salsa. 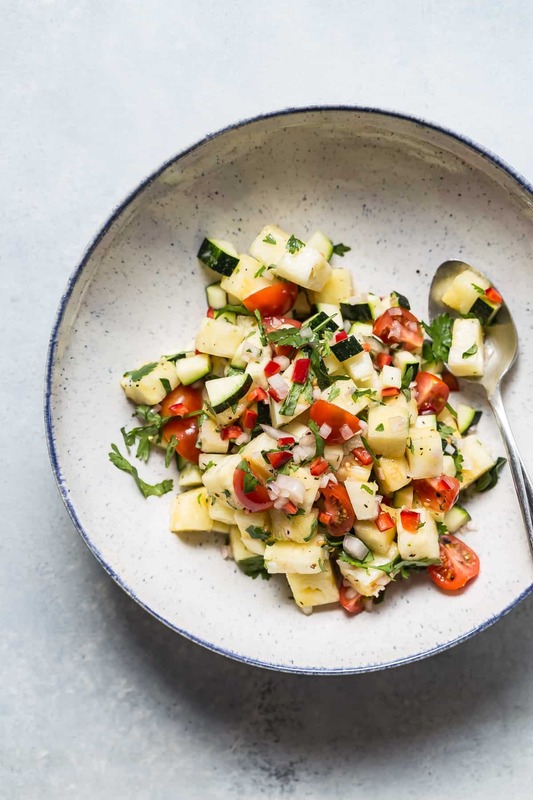 This is the perfect meal for outside dining this summer! Another salmon recipe, don’t shoot me! But this is Pan Seared Salmon. There must be a good reason why I have over 20 salmon recipes on the blog like this Cast Iron Skillet Salmon or these Grilled Salmon kebabs! Wait, I totally know why, It’s because salmon tastes amazing, It’s healthy, mega easy to cook and it goes with practically any other ingredient! Sometimes you don’t even need a whole bunch of sides to go with it if you get some nice fat sized filets. That’s why, for this easy pan seared salmon I went with a fresh pineapple salsa with zucchini, tomatoes and shallots. It’s savory, sweet and a teeny bit spicy from the chopped red chili which can be left out if spicy ain’t your thing. 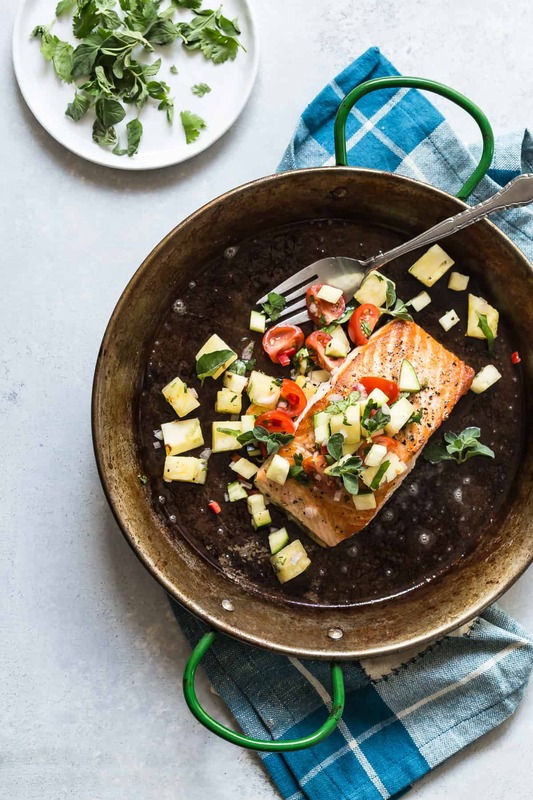 The salmon and salsa together make a good sized lunch or dinner, but feel free to throw in some quinoa or rice and you’ll be completely belly-rubbing satisfied. So what do we mean when we say “pan seared”? Find yourself an oven-safe pan and get it really hot. Things might get smoky so if you have a sensitive smoke alarm, have a towel on hand and get ready to flap it like crazy. Add some canola oil to the hot pan and gently place the seasoned salmon skin side up, let it sizzle over the high heat for a few minutes and then flip it over to skin side down. Transfer the pan to a hot oven and let it finish cooking. Easy, and by searing it quickly you’ll keep it moist but still end up with that crispy surface. 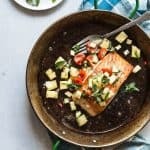 Top with some of the fresh salsa and your job is done, but be prepared for compliments because this is a salmon recipe that people will always bug you for! Place the first 10 ingredients into a bowl and mix together until well combined. Set aside. Preheat the oven to 425 degrees F. Add the canola oil to an oven safe pan and heat until very hot. Place each piece of salmon in the hot canola skin side up and sear for about 3 minutes. Carefully flip the salmon over and place the pan in the hot oven. Bake for 10-12 minutes until the salmon feels firm when pressed down on top. Place a piece of salmon on a plate and top generously with some of the salsa. I love fruit salsa on salmon! Your pineapple melange sounds divine! I am making this and eating it out on my porch ASAP! That salsa looks great, Gerry! What an awesome fresh, flavorful dinner! I never would have thought to put pineapple with salmon on my own. I love the pop of colors on the plate too! I need this for dinner ASAP. Salmon is one of our favorites too! I am making this ASAP. Looks soooo good. 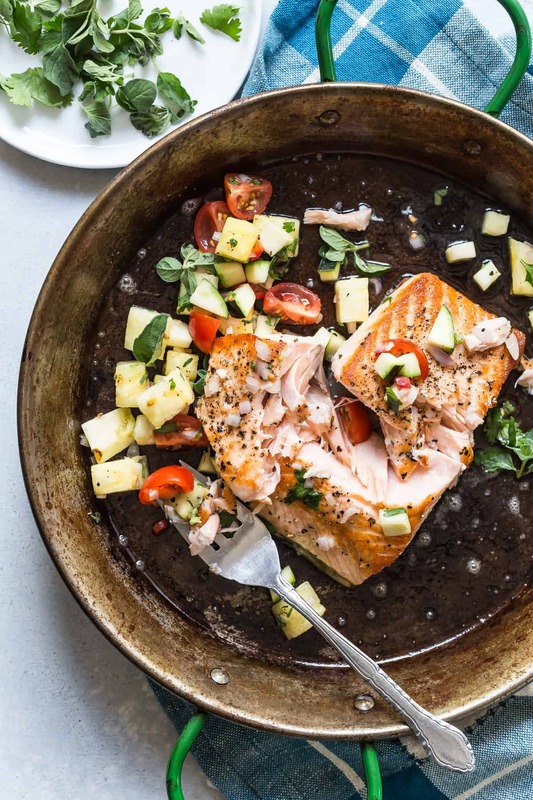 We love salmon and that pineapple salsa is a definite must-make! Dinner plans are happening now!